Our depots are clean, tidy and safe. Our staff have the knowledge to help you become a Market Leading Retailer and are always available to help. Our helpdesk operates throughout trading hours and our ambition is to never keep you waiting. We pride ourselves on our quick service given by our professional and knowledgeable staff. Our well organised shop floor is fully stocked for your convenience. Working with our trained logistics partner, we are able to give you a sense of control in knowing your order will arrive when expected. 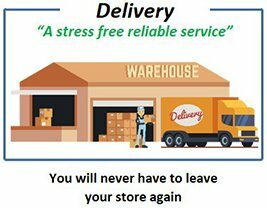 We provide a reliable service with real-time tracking, so as soon as your order is received we will give you a unique tracking number for you to be able to check on-line for the status of your delivery. 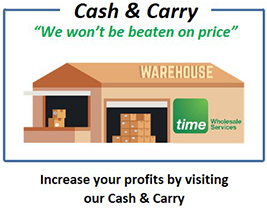 We believe in a one-price policy and deliver at the prices displayed in-depot. On any given day you can place an order for next-day delivery. Our secure and easy to use on-line ordering website allows you access to the on-line ordering system 24 hours a day, 365 days of the year – direct from the comfort of your business premises or home. You will never forget to order a product with our 'Quick Buy' feature that recalls everything you have ordered previously and checks you have not missed any item as part of your regular shopping list. All of your details are protected by the Data Protection Act and your payments will be secured through Sage Pay. 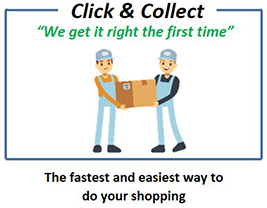 Our Click & Collect service is for customers that want peace of mind from picking up their products whilst benefiting from the time saved spent shopping on-line. Place your order with us online and we will have it ready for collection in-depot within 2 hours. Click & collect saves you time away from your business and gives you the assurance that your order will be picked correctly first time. It Is Time to Become a Market Leading Retailer.